Sophomore guard Justin Mazzulla faces off against two Richmond players as he makes a drive for the basket. The Colonials were defeated by the Spiders 76–56. 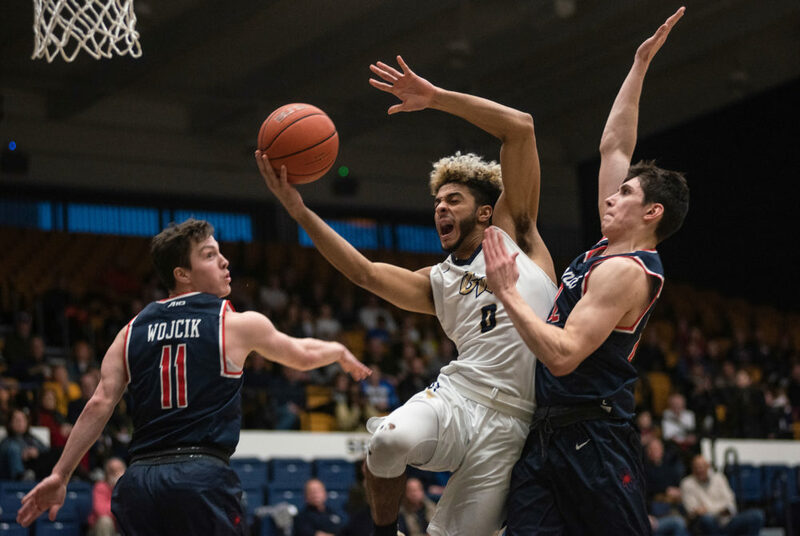 Men’s basketball’s game against Richmond Saturday looked to be a tight contest at halftime with the Colonials trailing the Spiders by three points after clawing back from an eight-point deficit. But the Colonials (5-11, 1-2 A-10) went ice cold from the field in the second half while the Spiders (7-9, 1-2 A-10) came out firing, pulling ahead by as many as 22 points before capturing their first Atlantic 10 win in a 76–56 victory over GW at the Smith Center. Sophomore guard Terry Nolan Jr. led the Colonials with 15 points – all of which came from beyond the arc – followed by sophomore guard Maceo Jack with 14 points and a team-leading six rebounds. GW ended the night shooting 32.2 percent from the field while allowing Richmond to shoot 53.5 percent on the night. Student-athletes were not present at the press conference after the game. The Colonials shot 25.0 percent from the field in the second half on a 7-for-28 clip while the Spiders shot 61.1 percent in the final 20 minutes of play. GW went 0-for-11 from the three-point line in the final frame after going 6-for-13 in the first half. “Today we had a lot of good looks and we missed a lot,” Joseph said. Richmond sophomore forward Nathan Cayo collected a floor-leading 18 points in the effort, followed by redshirt sophomore forward Grant Golden with 17 points. The loss marks the worst defeat GW has suffered since falling to Princeton by 21 points on Dec. 1 on the road. Their 32.2 percent shooting clip is their lowest mark since their loss to Vermont on Nov. 28. The Colonials had a sluggish start to the first half, missing two consecutive open three-point looks while the Spiders picked up three points of their own. Jack drained a shot from deep to knot the score 3–3, but the difference was Richmond made all of its first four shots in the opening minutes of play. Back-to-back three-point shots from Richmond freshman guard Andre Gustavon pushed the Spiders ahead 11–5 with 16:50 left to play to cap off an 8-2 Richmond run. A layup by Cayo grew the Spiders’ lead to 15–7 with 15:25 left before halftime. But the Colonials started to find their footing from beyond the arc and clawed their way back into the game. GW picked up nine consecutive points from the three-point line from redshirt junior guard DJ Williams and Nolan to pull within four points of Richmond 20–16. A jumper by redshirt junior guard Armel Potter – who logged seven points in 16 minutes of action – pulled together a 5–0 run for GW and narrowed the lead to two points with 11:42 left in the frame. Both teams traded baskets through the middle of the half before the Spiders grew their lead once more 31-23 after cracking open a 8–3 run with less than five minutes before the halftime break. An and-1 opportunity by Potter broke up Richmond’s run, and back-to-back threes from Jack and Nolan put the Colonials within striking distance of the Spiders 35–32 at halftime. GW entered the break shooting 38.7 percent on a 12-for-31 clip from the field while allowing the Spiders to convert 48.0 percent of their shots. But the Colonials could not pick up the pace in the second half while the Spiders embarked on a 10–3 spurred by back-to-back threes from Richmond freshman guard Jake Wojcik. A layup by freshman forward Matt Grace gave the Spiders their first double-digit lead 45–35 less than four minutes into the half. Sophomore guard Justin Mazzulla scrapped together five points for GW off three-point play and a dunk to cut Richmond’s lead 45–37, but the Spiders answered back with a three to keep the score out of GW’s reach. The Spiders continued to pile on the points while they held GW to 3-for-12 shooting with about 12 minutes left to play. Junior guard Justin Williams broke GW’s scoring drought with a bucket under the rim to put the score 50–39 with 12:37 left to play. The Colonials were shut down from the field – only picking up six points from the free throw line – until Jack drove to the bucket and made a layup to put the score 61–47 with 8:21 left to play. The Spiders outscored the Colonials 15–8 in the final seven minutes of the game and both teams emptied their benches as the clock wound down. GW returns to action Wednesday on the road against La Salle. Tipoff is slated for 8 p.m.